It usually starts like this for parents of active kids – especially parents blessed with very active kids. There’s a call from your child’s teacher. You were half expecting it. About two weeks earlier you met with her about your nine year-old’s behavior in the classroom. She said he’s a nice enough boy, very cute, however, he’s inattentive and easily distracted. That, and he’s much too active during classroom hours. Oddly enough, you’ve seen him at home when he’s using the PlayStation III. That too active, inattentive kid can be so focused on the TV screen he won’t budge – even if it’s pizza for dinner. He seems intensely attentive, to the point you have to pry him away from the game. Nevertheless, this time the teacher tells you “. . . your child still isn’t paying attention and he continues to be up and down all day long, and we are concerned.” She said “we,” so now you know there’s at least one other person at the school who’s concerned, and that concerns you. The teacher said she would like to refer your child to the school psychologist for an “evaluation,” with your consent. Your concern increases so, of course, you consent. After all, these are the experts, you reason, and you must trust them. You have a meeting with the school psychologist. She’s a doctor of some kind, and you’re a little intimidated. While you were expecting her to test your child, you’re given a behavioral questionnaire to complete too. You didn’t expect that, but that’s good. At least something is being done to help your son, and the experts are being thorough. You’re beginning to learn about the process, and you’re impressed. A doctor of psychology recommends you seek help from a doctor of medicine. By now, you know this is serious. You have to inform your family too, and that won’t be easy. You’re a conscientious parent, and you’re persistent. You want the best for your child, so you search for a “child psychiatrist,” as others have suggested. Maybe someone you know, or the school, makes a referral. If you’re “lucky,” you’ll find one. You’re learning a little more about the process. You meet with the doctor and, for the most part, you do most of the talking. You tell him about the school’s concern and the tests from the psychologist. Maybe your child is asked a few questions, maybe not. It doesn’t matter. He’s not there to talk. He really doesn’t need to be there at all. The doctor is there to make a diagnosis based on the information you give him. The doctor’s only function is to do nothing, or prescribe a chemical – and he can’t prescribe a chemical without a diagnosis. Within 10 to 20 minutes, the child psychiatrist has heard enough and says “. . . I’m prescribing a chemical to help with your son’s Attention Deficit Hyperactivity Disorder.” Maybe he calls it a “mental illness, or a “mental disability,” or “mental disorder,” or “psychiatric disease” or just plain “disorder.” It’s what you expected. You’ve talked with family and friends before this meeting. Still, hearing it for the first time from an MD makes it much too real. There’s a brief explanation of the “disorder.” He says something about “brain chemistry” and some sort of “imbalance,” and you know he mentioned “dopamine.” You know you’ve read about dopamine somewhere. It all sounded so “medical.” The special chemical he’s giving your son, you’re told, helps to fix all this, so that your son will sit still in his chair during school hours, and so your son will do his school work when the teacher tells him to do his school work. You’re anxious to get the treatment part of the process started. Well, you first have to know it will take some time – a few weeks, maybe more, maybe less – for the chemical to begin to have an “effect” because it has to “build up in his bloodstream.” Once in his bloodstream, you may begin to see some improvement, although there will undoubtedly be some “adjustments” along the way due to unpredictable yet very common “side effects.” It’s been made clear to you: there will be good days, and there will be bad days. Strangely enough, you’re still a little relieved. At least the medical doctor knows what your child “has,” and you leave the office confident this new chemical will help your child in school, and that’s all that matters. You privately fret your child has a “disease” or “disorder,” and you’re not clear how long your son will have to take this chemical – the doctor was vague about predictions – nonetheless, you’re reassured, and optimistic. The teacher is pleased you are taking steps to help your son. The school is happy too, and, to some degree, so are you. You find comfort when you hear, over and over from friends and professionals, “it’s just like diabetes.”* That means, thankfully, your son’s “ADHD” can be “treated,” with the right chemical. Four months go by and you’re disappointed. Yes, the teacher said she saw “some initial improvement,” but a month later, she began to complain again. You’ve had two “follow-up” appointments with the doctor to “review” your son’s chemicals to find out how they are helping or not helping. At the last appointment he increased the dosage of the chemical. Now, at this appointment, he’s suggesting a change of chemicals “that has less side effects, and better results.” Of course, this means this new chemical will have to “build up in his bloodstream” too, and there will be new “adjustments” to make along the way. By this time, you’ve done research, so this wasn’t unexpected. You’ve surfed the web for the past few months, read dozens of articles, and you’ve talked with other parents who also have children with “disorders.” Changing chemicals, up and down doses, extra chemicals for the “side effects” is the rule – not the exception. You’ve talked with some parents whose children are taking 3 or 4, or as many a 5 different chemicals. You hope you don’t get there. You’re troubled too. He’s not sleeping well. His appetite comes and goes. He’s not doing any better in school either – maybe a little worse – and now they’re talking about special classes, and you have to make some decisions. On top of that the doctor says he can give you another chemical to help with the “side effects” of the first chemical. You have to think about that one. You do, and you agree. Your child seems to be a little more distressed too, a little more unhappy, a little more frustrated, maybe a little more angry. You are too – all of it. It’s going to be a longer road than you expected, but you’re going to stay with it and do whatever is necessary. You and your child are now willing, all-in customers of the disease model of “modern” psychiatry. You can’t stop the “treatment” now. It’s been made clear to you, and you know it as fact, your son has a “medical condition.” Now you’re the one who educates others that “it’s just like diabetes,” and you wouldn’t dare stop treating diabetes. You now know everything you need to know about the process. You’re indoctrinated. You’re an advocate. You’re an expert. You’re fully prepared to indoctrinate another parent. 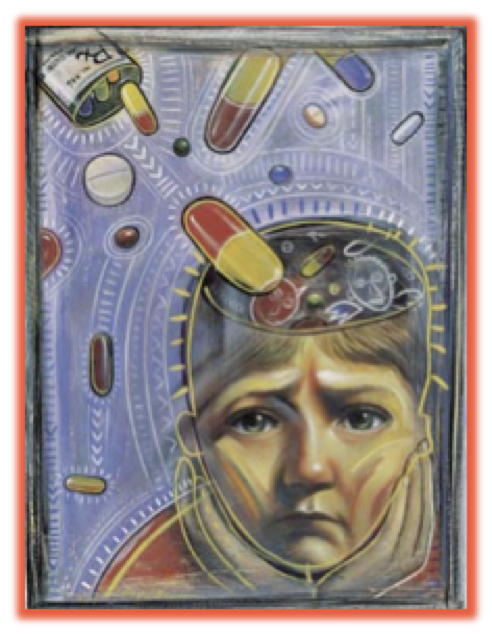 For a very real, very recent example of the indoctrination process, read a mothers story about her experience with her 8-year old son – and how he’s doing now – in her article in the NY Times: “Raising the Ritalin Generation” here. A brief interlude 2 . . . This is an important blog regarding your children. Most parents are ignorant to what stimulates their child or what distracts them. Children react to their environment in numerous ways. They are bombarded daily with stimulus. Parents seldom want to review the idea of not having a television. The intelligence of the child is also a variable. Intelligent children get bored. Intelligent children also tend to be more emotionally demanding and they react significantly to negative stimulus in the home. Children from divorced, seperated, or single parented homes also will display special needs. Even a split parenting home where the parental authority is constantly challenged by the other parent can add to the “condition” the child seems to be displaying. Children, like adults, seek to escape their troubled lives. School provides a calmer atmosphere than the one at home and this does make it easier to daydream. Teachers have plenty of other pupils to be occupied with, thereby giving the troubled child more time to do their dreaming. Children from troubled homes feel more anger, fear, confusion. Any home that does not provide a structurally disciplined atmosphere where the child feels belonging or safe is defined as a troubled home. Parents feel they are the least of the catalysts that may be the problem. Medication is an easy “fix”and it is accepted culturally. There are some children that do need medication but how often are children tested on a chemical hormonal level to indicate this? I would venture that the child would have to exhibit severe attention deficit disorder before such tests would be ordered by a professional. As a father of four girls, I have witnessed how hypersensitive intelligent children are and how hard they work to “belong” to the family unit. When the parents are unified, the problems with rasing children are extremely minimized and thereby reducing the stresses of change and growth in a family to the child. Reinforcement of mattering and being important has to be constantly applied. Structure is key. Parents have to share the same ideals about what their family goals are and what each member’s role should be. Discipline to maintain these goals must be applied equitably and consistantly. Children learn their parameters much quicker this way. They feel safe to make decisions and they feel safe to make mistakes. This aids in them learning to pay attention to life lessons. There is reward and fulfillment for doing this. Children want to please their parents when they are encouraged to do so in a healthy guiltless manner. Parenting is key. And most parents are clueless to being a structured parent. They wing it. And quite badly at times. Children are the people who respond and react to the varied parneting. In conclusion, the ADD begins and is reinforced at home when there is no chemical reason at fault. dont mess with OTHER peoples brains! come on.. who do you think you are trying to “fix” other people? you’re NOT god. i can’t believe that anyone could treat their children this way. you are the sick ones for not accepting their ways to look at the world. treat them with love for who they are and don’t try to change them. accept that they are not like you or how you would like them to be. its like you’re turning them into zombie robots!! its okay to be energetic and of course some kids will focus on the stuff they think is fun and dismiss what they think is boring. why do you have such twisted perspective? everybody doesn’t want to be apart of your lame system. try to understand this. try to stop controlling behavior. try to stop focusing on problems. your kid will think it has a diseace if you let stupid people convince you that your kid has a disease. your kid will feel bad if it thinks so. how is this going to help you’re kids? lol i scrolled through the “your kids aren’t sick” article. so this is not directed to the author of this article. i think it would be good if you would link that article in here to avoid confusion. some of the unsecured parents could think this is the way to treat their child and get the wrong idea. so this could accomplish the opposite of what your trying to change. two words: FREEDOM and LOVE!